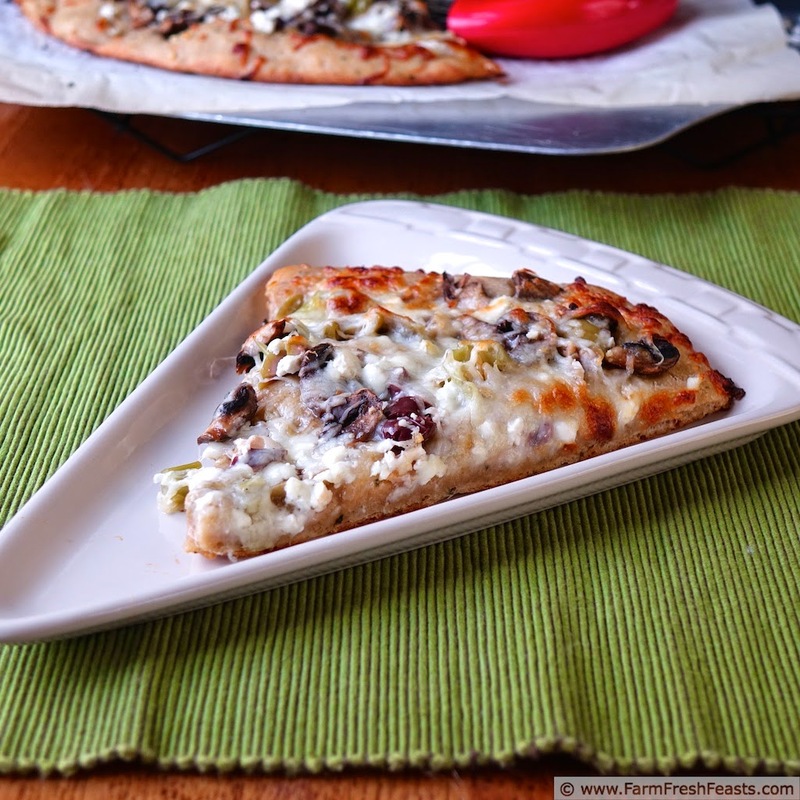 A recipe for vegetarian pizza topped with olives, sautéed mushrooms, feta and fontina cheese. Sounds gourmet but you'll make it at home! It's pretty slick when you can take a couple of containers out of the refrigerator and produce dinner, especially a dinner that would be found on the menu of some fancy pants pizza joints. [Can you be both fancy pants and a pizza joint? I think so.] Continuing my message of how to have varied and interesting pizzas at home, let's talk about long-storing preserved veggies aka Veggies in Jars. I started this . . . lesson? discussion? rant? soliloquy? all terms would work . 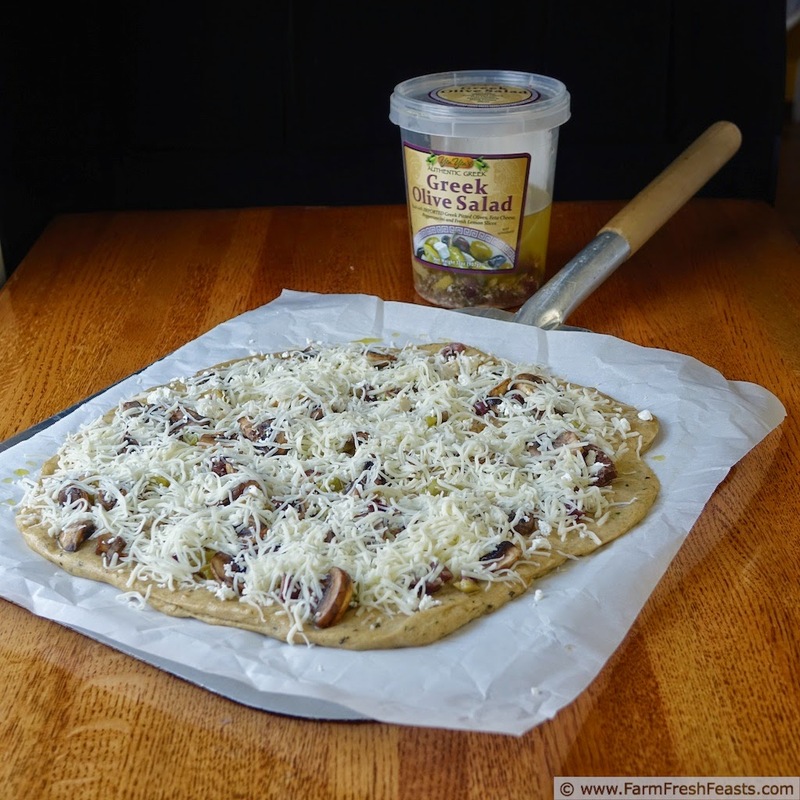 . . the other week with Cheesy Garlic Scape Pesto Flatbread, suggesting you make and freeze garlic scape pesto, fresh tomato pesto, roasted garlic and even plain old ordinary pesto while these items are seasonally abundant and inexpensive. Meghan reminded me to add caramelized onions to that list--how did I forget those?--and Angie suggested onion marmalade. Great additions for my list! Let's move the storage device from freezer to fridge and continue the discussion. My love affair with olives continues [hey, if my then-deployed spouse can go to a website and fall in love with . 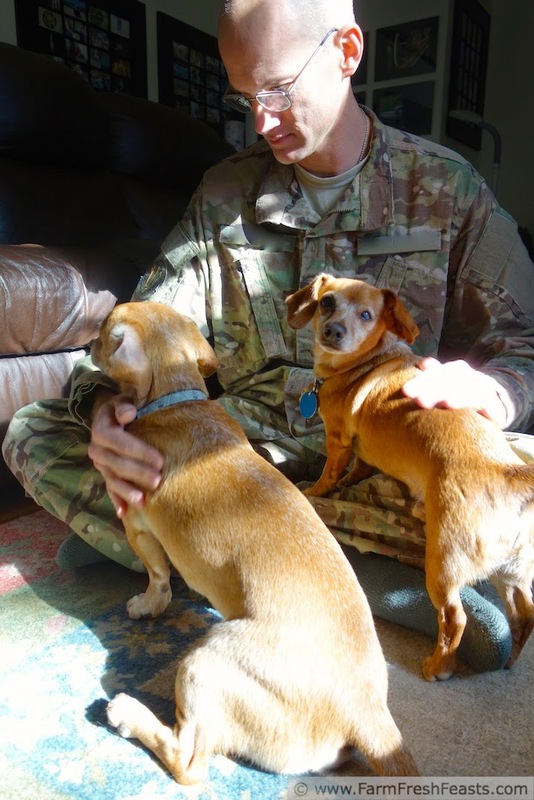 . . well, wiener dogs . . . why can't I carry on a love affair with olives?]. I've been buying olives by the Costco vat, and that means that I've got plenty for this pizza. Since I'm also buying feta cheese by the Costco vat--well, ♫ "put 'em together, it just makes sense"♫ *. Just like my Very Veggie Puff Pastry Pizza Bites, fresh spinach from the Community Supported Agriculture (CSA) farm share would go nicely on this pizza. For more pizza recipes, broken into category because I like to organize things a heck of a lot more than I like to dust, please see my Visual Pizza Recipe Index. For more recipes using mushrooms, please see my Mushroom Recipes Collection. For more recipes using vegetables in jars (or buckets, as the case may be), please see my Veggies In Jars Recipe Collection. They are part of the Visual Recipe Index by Ingredient, a resource for folks like me eating from the farm share, the farmer's market, the garden, the neighbor's garden, and great deals on ugly produce at the grocery store. For general hints, tips, and photo collages please check out my Pizza Primer post, a brain dump of all things related to making pizza in my home kitchen. For a photo album of pizza dough troubleshooting tips, please see my FB Troubleshooting Pizza Dough album. Preheat oven to 450 degrees Fahrenheit. If you've got a pizza stone, let it live in your oven like I'm letting 2 baby bunnies live in my front flower bed. [I hope the same fate doesn't befall the bunnies as happened to my beloved pizza stone.] If you haven't got a pizza stone, use a cookie sheet instead. Preheat a small skillet over medium heat, and add the butter to melt. Once the butter is melted, stir the mushrooms around to coat them with fat, add a pinch of salt (¼ teaspoon) and cook about 5-8 minutes until the mushrooms are browned and have given up their juice. Set aside for your spouse to nibble on. Come to think of it, you may want to start with 1 ½ cups quartered mushrooms. On an oiled piece of parchment paper, stretch out the dough into what shape pleases it. Brush dough with olive oil (honestly, dunking the brush in the Costco olive bucket was the easiest thing, which is why I didn't really measure the amount of olive oil). Scatter chopped olive salad (I included the lemons, too) and mushrooms evenly across the dough. Top with feta and fontina cheeses. Bake on the parchment paper for 5 to 8 minutes until the crust is set, then shimmy the pizza onto the pizza stone and bake directly for another 3 to 5 minutes until the cheese is bubbly. Cool on a rack for a moment, then slice and serve. *This blog has gone zero days without a Frozen song reference. Oh, my, I'm so excited. We just bought the most delicious olive salad at last Sunday's Farmer's Market and I have been using it but looking for different ideas. Pizza Friday dinner it is. I have all the ingredients for this fun and different recipe, including a big fat fresh porcini which I may use instead of buttons. And caramelized onions? This my friend is the perfect pizza. I'm loving olive salad--my folks have some from the Harris Teeter olive bar and I'm delighted to have the affirmation that it's a widespread phenomenon. A porcini sounds wonderful. And perfect with the onions. Thanks! This looks and sounds like one delicious pizza! Even the dough sounds wonderful! Thanks for bringing this over to Angie's Fiesta Friday! I'm glad the dough sounds good--I'm working on the post for it now. Somehow I'm involving my dad and the Sound of Music . 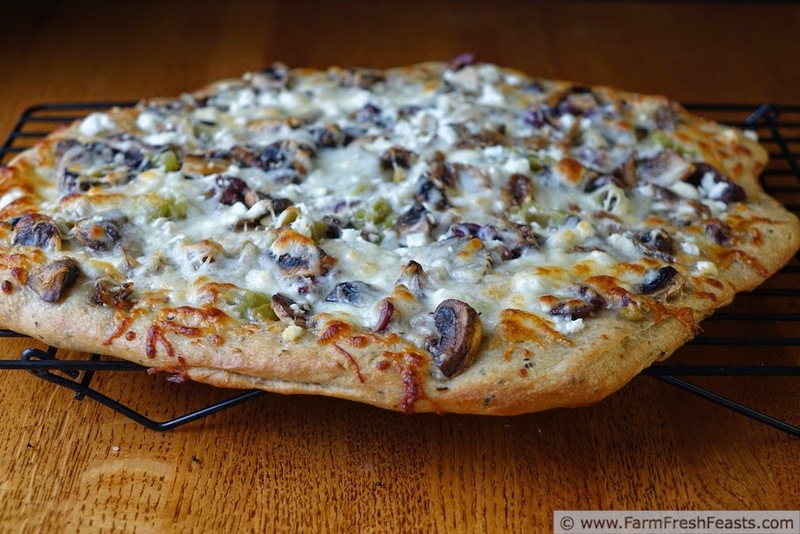 . .
Yum this looks absolutely divine, nothing beats a good homemade pizza! Speaking as someone who just had Armand's deep dish delivered so she could enjoy anchovies with her dad and brothers (mom ate an olive and feta pizza)--there is also something to be said about NOT having to crank up the oven and just sitting back to enjoy someone else's cooking after a morning of packing boxes. But yes, normally I'd agree that nothing beats homemade. Ahh! I would love to take one slice (or two? or three) slice(s) of this beautiful looking and delicious pizza! The dough sounds absolutely yummy, too! I go big when it comes to pizza (why do I make 2-3 pizzas every Friday night?) so I'd go for 3 slices of this bad boy. You should know that immediately after reading this yesterday (I was not in a position to comment), I removed a pizza dough ball from the freezer. If this isn't lunch today, it will certainly be tomorrow. I love pizza, and I love olives. I'm almost embarrassed I never thought to try this, but I'm so glad you did. Now you've got to try the one mom ordered today from Armand's--a deep dish pizza with black olives, feta, white onions, and a white sauce. It was yummy. I'm game to try that one next. This is GREAT!!!!!!! It looks AMAZINGGGGG.. what a great idea, I never thought of it and can't WAIT to try it, I think I'll be putting it on the menu this week! I love your site, thank you for sharing this! 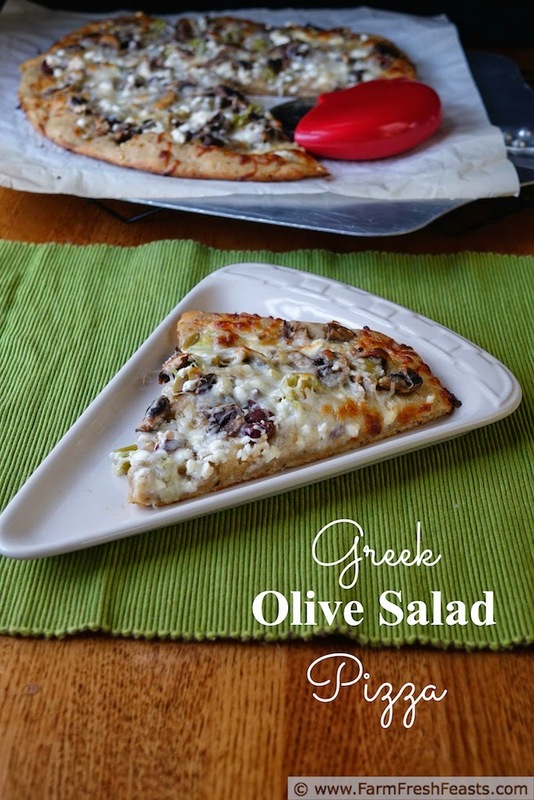 Love the bite of olives on pizza, and I always have some in the pantry. Now I just have to get organized, like you are, and stash some pizza dough in the freezer, too. Ha! Me? Organized? As if! But yes, I do tend to make double or triple batches of dough--especially if I've got marked down buttermilk in the fridge--and stash some in the freezer. Always a treat to just thaw a bag. I do have a bag of beet dough, though, that I'm just not into right now. Good thing it can hang out in the freezer a while longer. Or I'll turn it into Amy/Club Narwhal's pistachio pesto pretzels--they looked so pretty! Great combination of flavors! Love pizza ideas that don't include a red sauce. Red Sauce! We don't need no stinkin' red sauce! No idea why that flew into my head. I blame Wee Oliver Picklepants at my feet and a Summer Cider [empty] bottle beside me. Point is, pizza can be ANYTHING, and doesn't need red sauce to make it so.